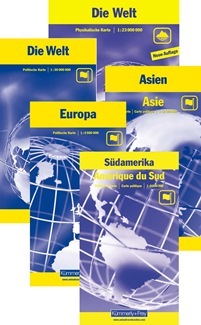 Nowadays this Swiss publisher is the most important player on the market in Switzerland for tourist maps. The Swiss cartographic quality guarantees a high level of accurate information. Craenen BVBA is the official distributor for Kümmerly+Frey in the Benelux and the UK. A wide range of tourist maps with up-to-date and detailed information to plan your trip as easily as possible. These maps provide a quick overview of the travel route, and are reliable travelling companions, whether your travel by foot, bike, train or car. Kümmerly+Frey road maps are very popular travel companions - for before, during and after once you have arrived. A clear map image and precision cartography are their distinguishing features, which are sometimes referred to as the "blues". 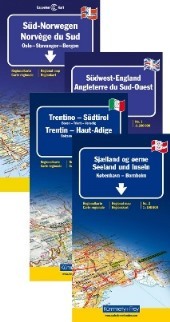 The series consists of well over 100 up-to-date road and travel maps. All the road maps have one feature in common: top-class Swiss quality. Using a Kümmerly+Frey blue map will open up a whole new travel horizon, you will be delighted. For everyone who travels around Europe frequently and needs or wants to plan his/her route in advance we recommend the Kümmerly Frey 1:800 000 road map series. These maps provide a quick overview of the travel route, indicate distances and offer information on road classification as well as being reliable travelling companions. Every map features a detailed index of places. The Kümmerly+Frey regional maps will make you feel at home even when you're on holiday. You will always know where you are and how far it is to the next tourist attraction. The regional maps are licensed editions published by well-known cartographical publishing houses. They are available for the following countries: Germany (8 sheets), Denmark (3 sheets), Italy (16 sheets), Great Britain (3 sheets), Norway (5 sheets) and Sweden (6 sheets). 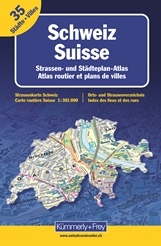 The Swiss road atlas is ideal for anyone who prefers to enjoy cartography in book form. One, two, three - and the map of the desired area is there in front of you. The handy format guarantees fast access. And it is great value for money! 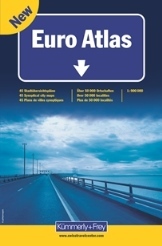 Over 400 pages of up-to-date Europe, featuring a clever colour-coding system: road atlas on a scale 1:900 000 including overview mapping at a scale of 1:4,5 Mio, 45 city overview maps, over 50 000 place name index, distance chart, motorway overview map, speed limits in and outside built-up areas, area codes, flags and much more! How many countries are there in the world? Where is Ashgabat? What is the capital of Afghanistan? What does the flag of Bangladesh look like? Kümmerly+Frey continent maps are ideal for anyone interested in such questions. The map image illustrates the political situation as well as featuring key road and rail connections, larger places, rivers, lakes and notable tourist attractions. Names on the maps are in English, the legend is multilingual. Every map features the flags of the countries shown. Kümmerly+Frey world maps come in a variety of scales and are available either in political or physical design. While the political version uses colours to separate countries clearly, the physical version depicts the earth surface in a variety of shades (relief shading).